A new Samsung smartphone carrying a model number of SM-G390F received WiFi certification late last month. The model number suggested that the device could well be the Galaxy Xcover 4. 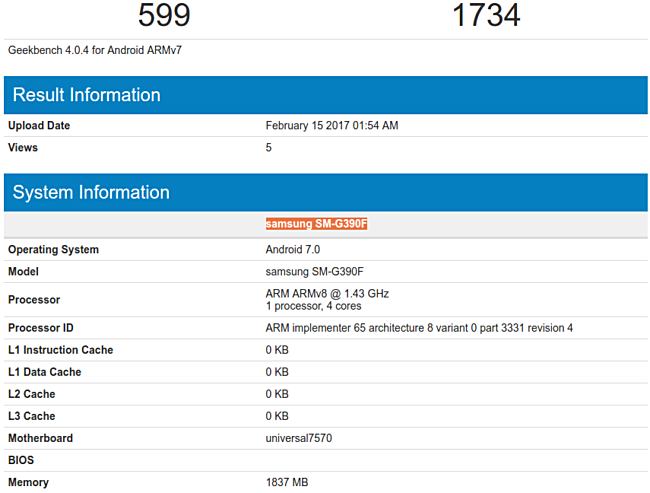 Now, the same device has been spotted on Geekbench. Aside from Android Nougat, which was revealed by the WiFi certification as well, the benchmark listing reveals a couple of other key specifications of phone. These include Exynos 7570 chipset and 2GB of RAM. Nothing else is currently known about the device, including its pricing and availability details. sammy could easily change that, instead of giving at&t a powerphone while the rest gets crap.